tell me about the wine! I spoke to Richard Childress when I was in Winston and he was telling me about his vinyard projects and how Yadkin was an east coast Napa. I am loving this "guest post" series you are doing - it is a great way to be introduced to such a nice array of bloggers. So I'm not really a soup person. But I'm pretty sure I'm in love with this soup. Sweet potato and butternut squash...can't get any better than that! Doc: have emailed Jean to add more to the post about the wine, so stay tuned, oh the vineyards here are wonderful. doggy bloggy: oh thanks I love finding new blogs to introduce to you, just found a lovely Finnish girl, to share a recipe! That is a great wine, and DB is right I am enjoying your post and the guest post! I had to research smoked puffin after that last Icelandic one! That looks like a nice baby food. Yep, I am loving it! Well, I've never thought of putting Amaretto in my soup! It's a bit odd to call this soup decadent since it doesn't have cream, but I think it's wonderfully decadent, flavorful and healthy! This soup looks very comforting. I wasn't sure what a bisque was, I thought it would have fish in it but this looks nicer. Oh my, this sounds delicious. Love sweet potato and butternut squash. I'm bookmarking this. It looks and sounds so good. All the ingredients that I love! Chef E: NC wines are great, come visit in the spring we can have lunch in a vineyard!!! That looks incredibly yummy! I love soup and will eat it anytime even on the hottest summer day (and where I live that can be 128 degrees Farenheit!). That looks so thick and delicious! And very comforting. This does sound nice, and I love the wine pairing. I can't thank all of you enough for the kind and flattering comments you have made regarding my Sweet Potato Bisque. I'm not a chef (or much of a cook really) so I don't come up with original recipes very often. So again, thank you! I have just recently started using Allspice in my recipes and find it to be a wonderful spice that brings a special characteristic to food. As for the Amaretto, I wanted to add almonds but knew they wouldn't blend correctly for a bisque so I opted for Amaretto - and if I do say so myself, it was an excellent choice. 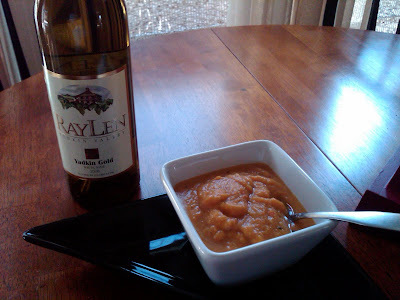 This bisque is definitely a comfort food but it is not just a cold weather food, it can be made anytime and used as an appetizer or as a pairing for your next wine dinner. Doc - the wine, Yadkin Gold from RayLen Vineyards, is a light crisp wine mostly derived from the Viognier and Riesling grapes. Chardonnay and Pinot Grigio keep the wine from being too sweet leaving it with a tropical taste of melon, fig and pineapple. It has a medium finish on the palate and is an excellent sipping wine on a warm summer evening as you sit out by the fire pit. I used to work for Richard Childress and we have had many conversations about North Carolian being the Napa of the South. We currently have 88 wineries in NC and at least 3 AVA's. Great soup! I love the shot of amaretto at the end! For all updates on North Carolina Wines, please visit: http://ncvine.com. You can join as a member and post comments in a forum or post a guest blog. We would love to hear from you. What a great combo for a soup.